This video on YouTube. | Read the full transcript. Customer focus is essential if your are active in the fields of enterprise service management or ITSM, because without customers there is no business. In this video Stefan Kempter explains how customer-centricity works, and how the YaSM service management model helps you with becoming customer-centric. The first of these processes is called "manage customer relationships". In this process, we communicate with our customers on a regular basis, manage the customer service agreements and deal with complaints. We interact with the customers at almost every stage of the YaSM service lifecycle. And there's also a process to deal with the financial aspects of the services. 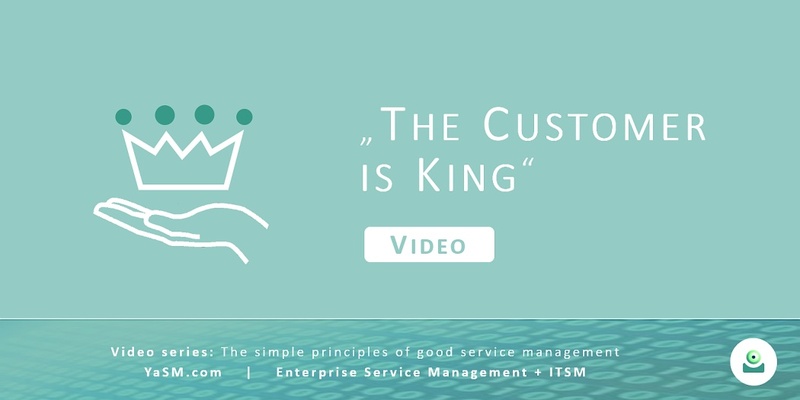 This video is the first one in our series about "the simple principles of good service management - and how to apply them in practice": There have always been a number of time-tested, simple principles in service management that we must get right in order to become successful providers of services. In our videos we explain how you can bring these principles to bear in your organization. Please ask your questions and share your thoughts in the YaSM support community! Part 1: The customer is king. - Customer service management in YaSM (on this page). Part 2: Vaguely defined services can't be managed. - Service definitions and service design. Part 3: If you stop improving, you will fall behind. - Continual service improvement. Part 4: Don't leave customer support to luck. - Customer support and incident management. Part 5: Without a strategy you cannot take the long view. - Strategic assessments and the service strategy. In the YaSM Wiki, there's a detailed description of YaSM's CRM process as part of the complete introduction to YaSM service management. Hello, my name is Stefan Kempter and today I'm going to start a new series of videos, highlighting the simple principles that we must get right in order to become successful providers of services. My very first video is about focusing on customers. That's a pretty obvious starting point, because, without customers, running a business is pointless, and paying bills and salaries is difficult. But then again, not everybody seems to have understood this simple truth. I would even say that, judging from my own experience, awful customer service is quite common, and the reason may be that it is not so obvious how a customer-focused organization can be created. So today we speak about how customer-centricity works, and how the YaSM model helps you with becoming customer-centric. To start with, I'd like to raise one important point: Customer-centricity is not about fulfilling every imaginable wish of all customers at any cost. It is rather about providing adequate services for certain groups of customers, based on their needs, and customer centricity must go hand in hand with trade-offs between what your customers ask for and the cost of providing it. After all, if you have lots of happy customers that do not make you profits, running your business will also be pointless. But now, how should we go about creating a customer-focused organization? This kind of advice is a good starting point. It can help you with understanding what it means to be customer-centric, and your first step should be to produce and communicate a vision statement in your organization, with a list of clear and easy to understand core values towards your customers. But this is really only the first, small step, because without adding further substance such statements will have no real impact. In particular, you will have to translate your vision of being customer-focused into readily actionable guidance for the people working in your organization. And this is where YaSM comes into the picture: YaSM describes a set of processes which ensure that you stay focused on your customers' needs and build up a loyal customer base. For example, when developing the service strategy, we assess if our range of services is in line with customer needs or if additional services should be added to the portfolio, and we also take a look at what our competitors are doing. As we design new or changed services, we ask the customers for their input to ensure the new services are in line with their needs. As for service implementation, there is usually not so much interaction with the customers during this stage of the service lifecycle, but often it makes sense to keep customers informed about the progress of the work, and in some cases we may ask them to take part in user acceptance testing. Then, when the services are operational, we keep customers happy by providing good customer service, for example by resolving service incidents and fulfilling service requests in a professional way. And as part of service improvement, we ask the customers on a regular basis if they are happy with our services or if they have any suggestions for improvement. And finally, there's a process to deal with the financial aspects of the services. This ensures that we know the costs of providing our services so that we can make informed decisions, and this process also takes care of invoicing our customers. So we have a number of processes in YaSM to make sure that your organization stays focused on the customer, and the good news is that all of these processes are described in great detail in the YaSM process model. This model is available, for instance, as a collection of Visio® diagrams, and before we finish today's session I'd like to show you just a few examples from the YaSM model in Visio. Here in Visio, we start with the top-level diagram, presenting a high-level view of the YaSM processes. These processes here are of course the ones I introduced earlier in this session, and now, if we want to learn, say, what's going on in customer relationship management, we can simply click on a link to go down to the next level of detail. In the upper part of this diagram we find that the result of the meeting is a customer meeting minutes document, and for such documents we provide ready-to-use templates. These templates can be opened with a mouse-click, and - as you can see - they are delivered in Word™ format and describe the typical contents of the YaSM documents. This means that, in this example, it is not too difficult for you to figure out what information you should collect during the customer meetings, and of course you can use this document as a template for the meeting minutes you create in your organization. All right, let's now go back to Visio because I want to point out one more important thing: Of course producing meeting minutes only makes sense if this information is picked up by somebody else who then takes action. That's why we show in these diagrams where the process outputs go to. In this case, for instance, the meeting minutes are a key input for the strategic process, as well as for designing and improving services. So this is the kind of advice you find in YaSM. I hope you will agree that, with these process diagrams and document templates, it is not too hard to establish what you need to do in your organization to become more customer-focused. And of course you don't have to implement the YaSM processes to the letter. You can pick and choose those parts from the YaSM model that work for you, and you can also adapt the processes to the needs of your organization. Thanks for watching, and if you have any questions we are happy to answer them in the YaSM support community.